Nick Caraway (Tobey Maguire) decides in the boom of the 1920s to become a trader in New Work, taking a small house in Long Island. 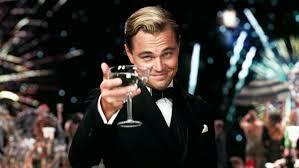 He soon becomes lured into the wild, decadent life of his neighbour, Jay Gatsby (Leonardo DiCaprio). In the spin of things are his cousin, Daisy (Carey Mulligan) and her husband, Tom (Joel Edgerton). The idea of Baz Luhrmann making the film got me quite excited – it really needs the lavish touch that only Baz can bring. I had been concerned that some of the deeper moments may be lost – especially as I’d heard on the grapevine that the film was only about glitz and glamour and lost the key themes. I must read the book again, but for me it worked beautifully as is. I must keep my eyes open for if it gets re-screened in 3D. I’d like to see that, especially the tracking shots through the amazing parties.